Thank You for Your Interest in Employment at Wolf Creek! All positions are winter seasonal and require providing positive contact with guests, balancing team and individual responsibilities and meeting physical demands of standing throughout the workday. All positions offer skiing privileges and competitive wages. Professional Ski Patroller – Full time, paid professional ski patrollers. Minimum qualifications: strong skiing ability and EMT-Basic certification. Snow science background, explosives experience, avalanche safety training is a plus. Snow Reporter – Full or part-time desk position, from 6am to 3pm; must have interactive web experience, command of Microsoft office, and strong organizational & communication skills. Freelance photographer and videographer – Specialize in action shots to explore the ski area and capture scenes, skiers and terrain during weekdays, weekends and holidays. Ability to be available on short notice required. You will need your own suitable equipment (camera and lenses) and be proficient with Lightroom and/or Photoshop. Strong skier or snowboarder preferred. Base Operations – Full and part-time positions available. Duties involved in the daily operations of the base area include basic maintenance, parking guests and snow removal. Lift Operator – Full and part-time positions available. Duties include assisting guests in loading, riding and unloading chairlifts, daily set up and routine maintenance of lift areas and snow removal. Treasure Sports – Part-time, 23 hours weekly. Must have prior experience in POS system. Friendly, hard working, organized with good communication skills. Custodian – Part-time and full time positions available. Job duties include cleaning restaurant facilities, restrooms and vacuuming. Food & Beverage Employees – Managers, assistant managers, line/grill cooks, bakers and baristas. Ticket Office Cashiers – Job duties include assessing guests requirements/needs, operating a point-of-sale system, selling tickets, customer service, cashiering in restaurants and balance daily transactions. Ski School Instructor – Part-time and full time positions available. Job duties include teaching guests in a group setting, customer service and other duties assigned by supervisor/company management. Ski/Snowboard Rental Tech – Part-time and full time positions available. Job duties include proper selection of equipment, fitting ski/snowboard equipment and adjusting bindings. Applications can be downloaded from this page. 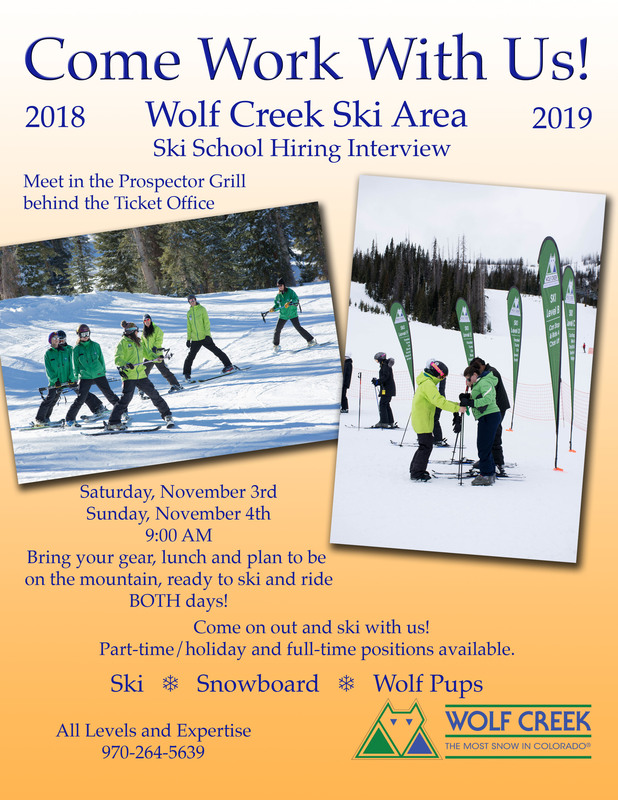 Send resumes and applications to wolfcreekski@wolfcreekski.com or P.O. Box 2800, Pagosa Springs, CO 81147. About Applying: The employment application is used as the primary means of recruiting new staff. Applications are accepted for all departments, all season long. When a department has an opening, the department supervisors select candidates from the applications on file. Therefore, completing and submitting an application is crucial. Please list by number (1st, 2nd, and 3rd) choices next to the departments. This helps us in choosing outside jobs for people who enjoy being outside or inside jobs for those who prefer working indoors. After completing two weeks of satisfactory work, an employee season pass may be issued, enabling use of the ski area lifts. Full-time employees can use their pass whenever not scheduled for work, while part-time/holiday employees must obtain consent from their supervisor before using their pass. Full-time employees may also be issued one complimentary lift ticket for use by family or friends, after February 1st, of their first season. A full-time employee must be working a minimum of 3 days a week to qualify for this privilege. Employee passes and complimentary lift tickets are not valid December 27th – 31st. All employees receive a 25% discount on food and non-alcoholic beverages while in uniform. All employees also receive a 25% discount in Treasure Sports on select items. Part-time/holiday employees must commit to working holiday periods including Thanksgiving, Christmas, Spring Break, Presidents’ Day weekend and MLK, Jr. weekend. Prospective employees are responsible for securing their own housing and reliable transportation. The nearest housing sits at the base of Wolf Creek Pass either in Pagosa Springs (23 miles to the West) or South Fork (18 miles to the East). Over peak periods, Wolf Creek does offer an employee shuttle system in which the employee is paid for a half hour to ride the shuttle each direction. Wolf Creek cannot currently sponsor any work visas for foreign applicants. If you are already authorized to work in the U.S. and feel you can secure your own housing and transportation, we encourage you to apply via our application process.